Today I ate a Belgian waffle, covered in Belgian chocolate, in Belgium. I feel as though this is a major milestone in my life. It was, in fact, among the greatest tastes I have ever had meet my palate. Mouth, meet heaven. 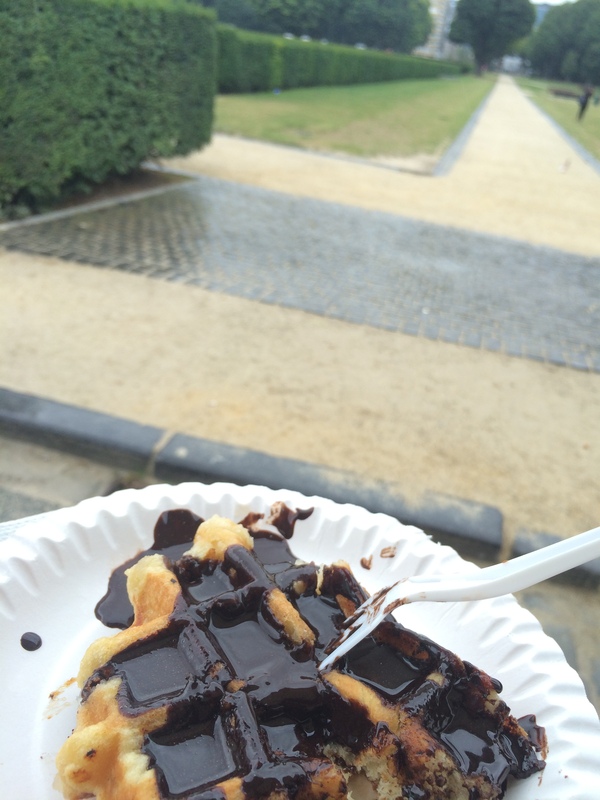 Belgian Waffle, topped with Belgian Chocolate, in Belgium. FTW. This isn’t how I normally talk about food; if you know me, you’ll know that I’m perfectly happy eating the same thing for lunch every day of the year. I do love good food, though, when I get it – and this was really an exception to all expectations I could reasonably have about a three-dollar lunch. All food chatter aside, I also saw some really neat buildings in the city center of Brussels, the capital of Belgium and of Europe. (I did make a point of walking through the business district to get a glimpse of the EU Parliament buildings.) The architecture is lovely, particularly in the [read this in French] Grand Place (or, read in a Dutch tongue, “Grote Markt”). The restaurants (all too expensive for my food-truck budget) packed into the narrow alleys just north of that plaza were fun just to observe in passing. Restaurant district to the N/NE of the Grand Place in Brussels, Belgium. 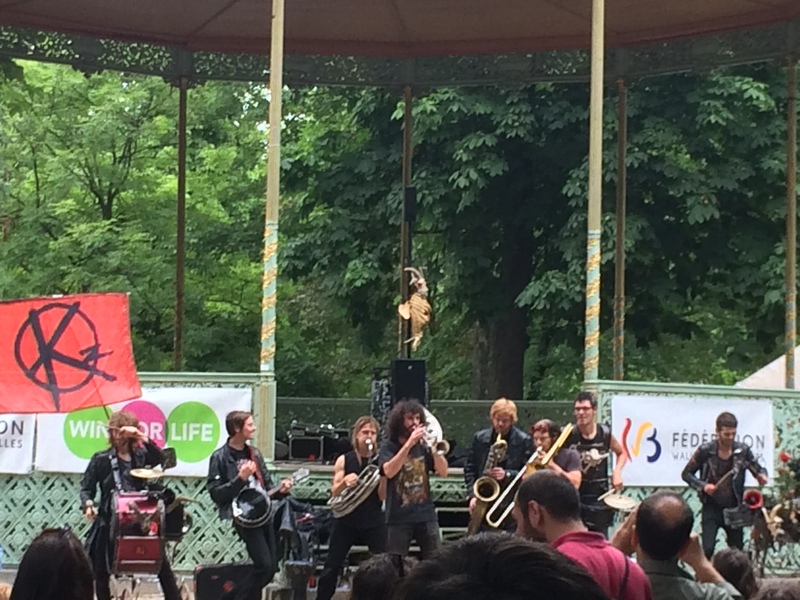 A surprise highlight on my 11-mile walking day was finding a concert in the Royal Gardens at a bandstand and grove of trees that protected band and observers from the steady rainfall that followed me through my day. The performers were a band I can only describe as playing gypsy rock, possibly devil worshiping (but probably not in seriousness), and with a sense of humor I’ve only seen in one other band. It was enough to get me wondering who they were, but I’ve been unable to find them online. If you know anything about these guys, please do let me know. I’d gladly listen to them in my car on the way to work. I hope to return to Brussels. I have another full day here, but I believe I’ll be using it to visit Gent – just a short train ride to the north. Gédéon-Nicolas-Joseph Bordiau’s archway (modified from a single arch to a tri-parte arch by Girault, who succeeded the original architect) in Brussels, Belgium. Thank you, Wikipedia. 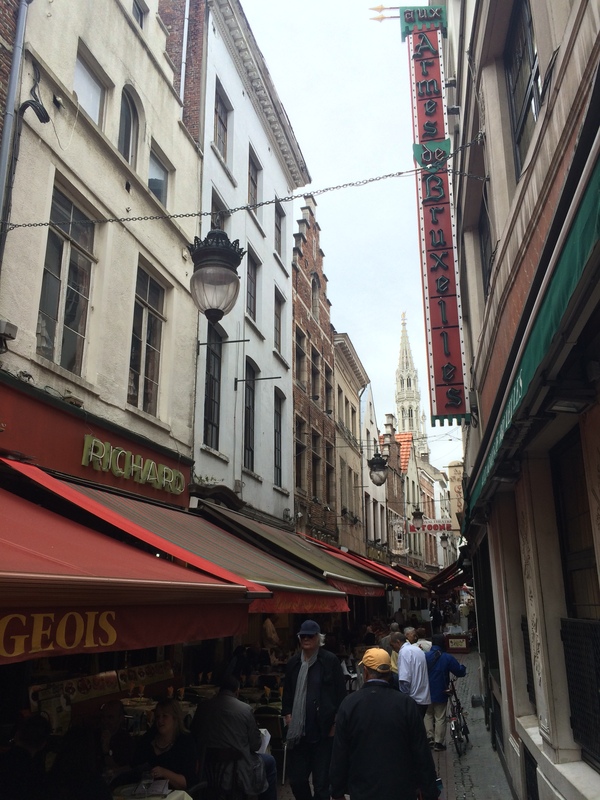 This entry was posted in 2015, Travelogue, Travelogue 2015 and tagged belgian waffles, Belgium, Brussels, chocolate, europe, grand place, grote markt, Royal Gardens, St. Catherine's, St. Michaels and Gudula, travel, waffles, walking tour. Bookmark the permalink. Secondly, I’ll read the post later! 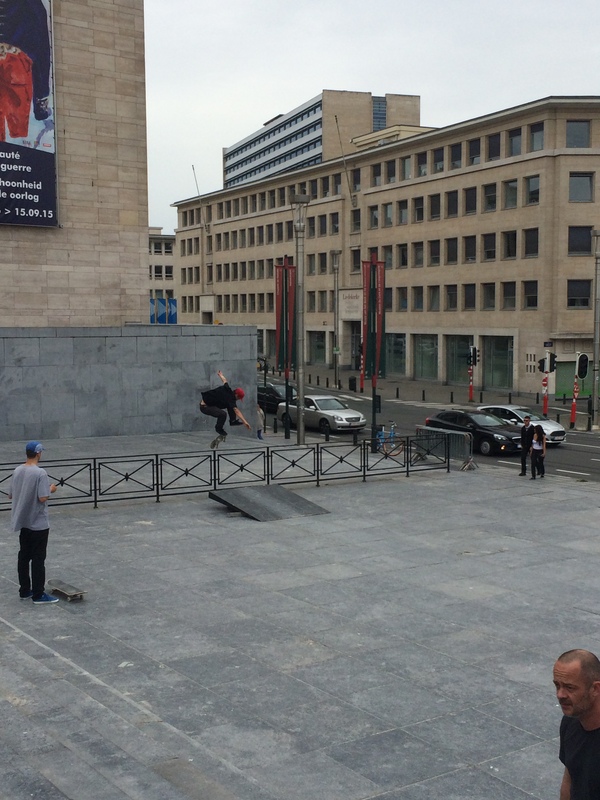 Did someone recommend you travel to Gent next time you’re there? What’s the appeal there? And is the other band you know with a similar sense of humor the Talking Heads? Just a guess. And maybe you can check out the festival’s website- it might be able to let you know who the band was.